7.12 points at 25 votes (rank 323). 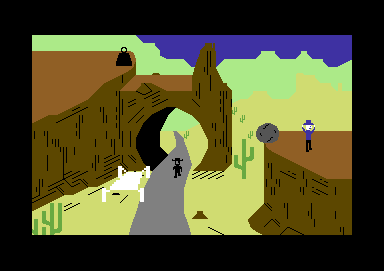 Rombachs C64 Game Guide part 2 8 1986 - "Vote 2"
In the game, different scenes from a Western movie are shot. 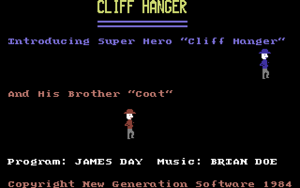 Either you play the hero "Cliff Hanger" on your own, or twosome when his brother "Coat" joins in. 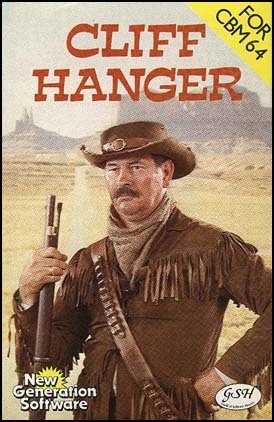 The aim is, to release an action at the right point of time, to "kill" the bandit "El Bandito", who runs through the screen (e. g. roll a rock, throw a boomerang, fire a canon, etc.). The scenes are chosen randomly by the program and are repeated until the action was successful. The title of the scene gives a hint to what scene will come up. Comic-like and utterly funny pseudo 3D design with rather simple graphics but good animation of the different film scenes. In addition there is an approriate music and FX. During all the scenes exact timing is important. So you need to remember for every scene type, how long it takes from starting the action to the happening of the effect. 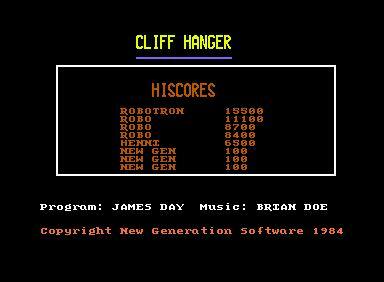 Cliff follows the joystick movements (joystick in port 2). By pressing fire, the action is started. Do not go to near the the edge of the cliff, partially it is better just to walk straight forwards (joystick left or right). Keep the positions of the bandit in mind and correct the point of time for starting each action at the second try. In the Longplay-video by Reinhard Klinksiek (see links) you can view all scenes and memorise the solutions. As you will see, there are very cunning actions in there. Additionally, every starting point in every scene has to fit. Pure mnemonic training ...! Sledgie: "Very funny game. It reminds one a bit of Roadrunner and the coyote from Bugs Bunny." Alex: "Difficult, but when you made it once, you are doubly thrilled :-)." Robotron2084 :"An unbelievable bizarre-freaky little game with many surprises and a lot of modular components from Warner Brothers cartoons. Sometimes you need to go very long-winded ways to reach the goal and some levels you'd better learn by heart. 6.5 out of 10 points." Rombachs C64-Spieleführer Teil 2: "Underlying, the game is built up very inventively. The design is based on some very good ideas. However, the plot is a bit macabre, as it is really only about killing bandits. Is this really the right topic for a game? 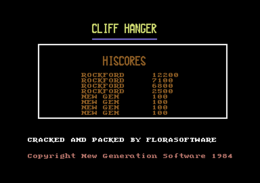 (Vote 2)"
Rockford :"At the beginning it is relaxed and funny, but starting from the second wave it gets really hard, when a failed try means losing a life on the screen. Timing and learning by heart are trumps. You should play it with a stopwatch in your hands. Graphically and acoustically very low niveau. 5 points from me because of that and due to the erratic rising grade of difficulty."